MRW someone said Lemurpalooza is BACK! Lemurpalooza is back again for yet another exciting palooza for Summer 2016. Hosted by Duke Lemur Center, Lemurpalooza 2016 will have food trucks, live music, and lemurtastic activities for kids and kids at heart. You can also walk around and view the lemurs at your own pace (usually you'll need to be escorted by a tour guide) as well as being able to "adopt" the lemurs. Money from these sponsorship goes to maintaining the lemurs at Duke Lemur Center as well as to fund conservation work. As usual, I will be at Lemurpalooza this year. Hear me talk about my color vision research and learn more about my ruffed lemurs! You will be able to see all the ruffed lemurs that I mentioned in my blog posts, especially Halley & Pandora. Come find me at Lemurpalooza! You will also be able to "adopt" some of the lemurs as well and I do encourage you to do so, not only for the animals but also for all the necessary conservation work in Madagascar. THIS IS ONE OF THE FEW EVENTS WHERE ADOPTING A LEMUR IS PERFECTLY OK! Bring a blanket, join us for a picnic, and meet the lemurs in the Adopt-a-Lemur Program at the Duke Lemur Center (DLC), from 5 to 8 p.m. on Saturday, June 4th. Your sponsorship will help us care for the lemurs at DLC and support the conservation work we do around the world. NOSH, a wonderful supporter of the Duke Lemur Center, will be selling picnic style dinner at Lemurpalooza. They will be offering burgers, their famous brisket and portabella mushroom burgers for vegetarians or bring your own picnic basket. Come meet unique primates you can’t see anywhere else in the U.S. This will be a special evening experience that allows families to stroll and view the animals at their own pace (Usually a visit to the center must be a guided tour.) Keepers and education staff will be on hand to answer all questions about each animal up for adoption. Engaging educational activities will be provided for kids and kids at heart. Community fun, gorgeous lemurs, and an opportunity to conserve the environment and endangered animals all add up to a perfect summer evening. In 2012, lemurs were named the most endangered mammals on the planet. The Duke Lemur Center has been caring and learning from lemurs for nearly 50 years. It is the world’s largest sanctuary for these animals outside of their native Madagascar. When you adopt a lemur, you not only help cover the $7,400 per year cost it takes to care for each animal, but also support our work in the U.S., Madagascar and around the world to study and save these endangered animals. 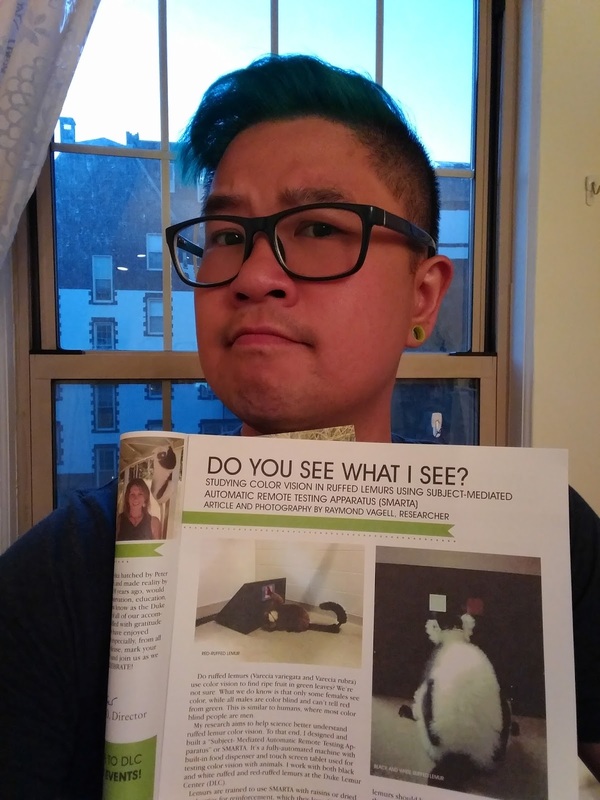 With your tax-deductible donation, you’ll receive regular updates and photos on the animals of your choice, and you won’t have to scoop the poop! These animals stay at the Duke Lemur Center, and we do the dirty work. In addition to adopting a lemur, you can help save lemurs by entering our silent auction and featuring great DLC experiences and swag along with other community goodies! Raven, our ‘movie star,’ had her big screen moment in the recently released IMAX documentary, Island of Lemurs: Madagascar. Tasherit is a busy crowned lemur mother, managing the demands of two young boys! Teres is our super-star ring-tailed researcher who can find food in a puzzle box faster than you can blink an eye. Presley is a blue-eyed black lemur named after the blue-eyed ‘King of Rock ‘n’ Roll.’ Blue-eyed black lemurs are one of two non-human primates to have truly blue eyes. Pompeia is a six-year-old Coquerel’s Sifaka and recent mother who is one of less than 60 individuals of her species living in captivity. Grendel is a male aye-aye. The Duke Lemur Center has had more success at breeding aye-ayes than any other institution in the world. Thistle is a teacup-sized female mouse lemur. Because mouse lemurs develop Alzheimer’s-like symptoms as they age, researchers at the Duke Lemur Center hope their non-invasive mouse lemur research will help us better understand the aging brain. Reservations are required. Call 919-401-7252 to reserve your spot and mark your calendar to meet the new adoptees at the Duke Lemur Center. Tickets are $50 per car and are fully tax deductible. WHEN: 5 – 8 p.m., Saturday, June 4th, 2016. 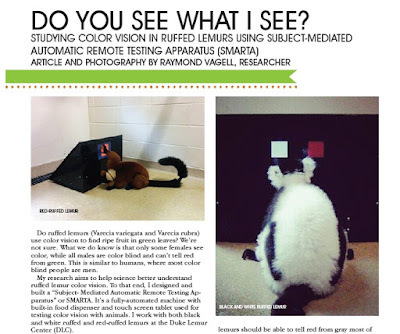 My ruffed lemur color vision research at Duke Lemur Center was recently highlighted in their 2016 Spring Newsletter! Here's a link to the PDF version of this newsletter which I have uploaded on Research Gate. To sign up for Duke Lemur Center newsletter please click here.